Chór i Orkiestra Teatru Wilkiego – Opery Narodowej / Lothar Koenigs. Teatr Wiekli – Opera Naradowa, Warsaw, Poland. Saturday, June 10th, 2017. 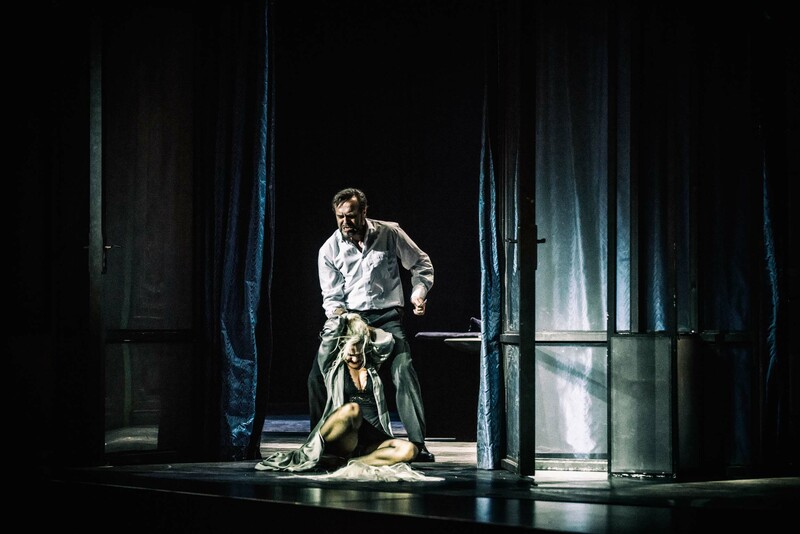 In common with last weekend’s Rosenkavalier, Die tote Stadt is also a work that focuses on the memories of times past, in this case of a man dealing with the grief following the death of his lover, living in a city where time stands still – the dead city of the title. Loosely based on Georges Rodenbach’s 1892 novel Bruges-la-Morte, Korngold’s youthful opera, premiered when he was 23 years old, is a massive sing for the two principals, especially so for the tenor, Paul, who has to cope with a cruelly high tessitura and is on stage almost throughout the entire evening. 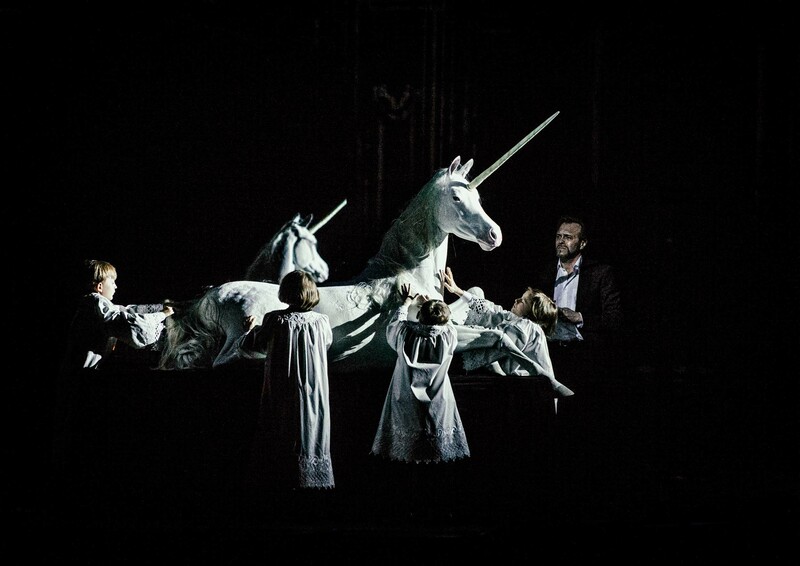 The staging was the work of the Teatr Wielki – Opera Narodowa’s artistic director, Mariusz Treliński. In it, he provided a dream world apparently inspired by black and white gothic movies, where we were not sure what was real and what was in fact a dream. 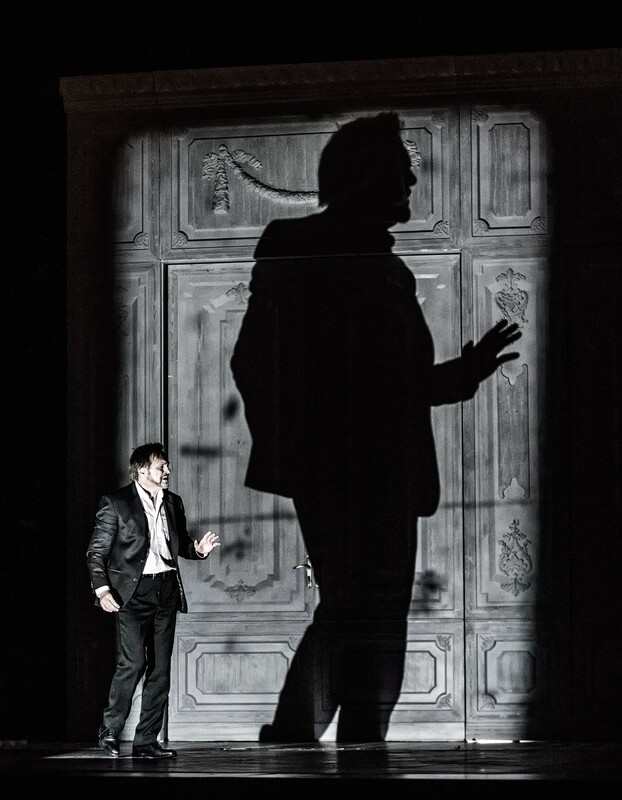 Treliński demonstrated some phenomenal stagecraft – making use of a revolving stage and atmospheric lighting (Marc Heinz) that at times made us question whether the walls of the set even existed. The staging felt exceptionally fluent. What Treliński also brought out successfully is how for Paul, his apartment is his world. In this respect it’s also true to Rodenbach’s novel where the equivalent character of Paul, Hugues’s only initial contact with the outside world is his daily walks. It’s when he leaves the apartment and routine that things start to fall apart for him. 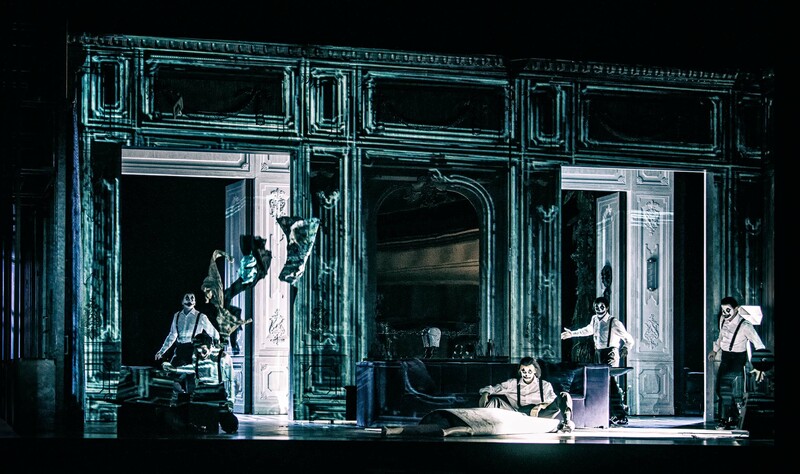 Here, during Act 1, the stage was in constant motion but when he stepped outside in Act 2, the city was barely revealed, existing in that liminal state between real and tangible with the singers on a run way over the pit and one character walking into the audience. The black and white movie aesthetic was also brought out in the costumes and lighting, with Marietta’s otherness reflected in the fact that she wore a green dress and Marie’s ghost was a dancer in a white dress, both contrasting with the monochrome costumes of the others. Treliński also gave us several impressive coups de théâtre – Marie’s body hovering seemingly in thin air as Marietta manipulated it in the graveyard scene. I found that it wasn’t just a technically impressive staging, it was also a detailed illustration of a man’s descent into madness and obsession through grief. This was illustrated by Jacek Laszczkowski’s Paul in a fearless performance of great physicality. Laszczkowski was exceptionally brave to take on this punishing role and certainly deserves our admiration for giving it all he had. Sadly, the result wasn’t especially easy on the ear. The role appears to take him far beyond his limits – the inability to sustain the line most apparent. The voice sounded tight and the placement inconsistent and lacking in resonance. He did make it to the end and deserves our gratitude for his physicality and for daring to take on this horrifically challenging sing but I’m afraid to say that it was effortful for him and for the audience. The public did give him a warm ovation at the end. Marlis Petersen was very fine in her dual roles, in a way a cousin of her acclaimed Lulu, similarly calling on her magnetic ability to dominate a stage. The voice has quite a sweet exterior (though never sounded saccharine) with a creamy core that seemingly defies gravity. So much of what she did was through using the text to colour the tone. She phrased her music with real beauty and her clarity with the text meant that the Polish and English surtitles felt superfluous. The voice blooms beautifully on top with a ravishing hint of vibrato. Certainly a notable assumption. The remainder of the cast maintained the respectable standards that one has come to expect at this address. Bernadetta Grabias also tackled the challenging tessitura of Brigitta with aplomb, a role that requires a contralto with a soaring top. Michał Partyka got to sing the opera’s standout number, the lovely Pierrot-Lied and he dispatched it with a handsome, healthy, youthful baritone with a firm top. The chorus displayed fine unanimity of tone in their brief extracts, including the well-prepared children’s chorus. The orchestra played extremely well for Lothar Koenigs. Given that this was a premiere, their accuracy was staggering – not a split note or false entry all night. String intonation was impeccable throughout. Koenigs brought out the big, bold technicolour of Korngold’s orchestration with sighing portamenti in the strings and extravagant harp glissandi making themselves known. I have to admit I found his interpretation somewhat disappointing. Partly as a result of working with relatively small voices, he was a sympathetic accompanist, always allowing the principals through but to the detriment of forward pulse. Tempi also seemed to favour languor over dramatic impetus. In the closing tableau, Treliński left us reflecting on whether what we saw was a dream or a reality for the characters. In so doing, I certainly left the theatre considering whether the opera itself was the thoughts of a man facing death himself or a way for him to deal with his grief. In many ways, this was a cerebral rather than a visceral, emotional staging. Yes, the singing was variable and there were issues with the conducting. Yet above all, this was a fascinating meditation on the temporality of memory, one that was executed with great fluency and imagination.